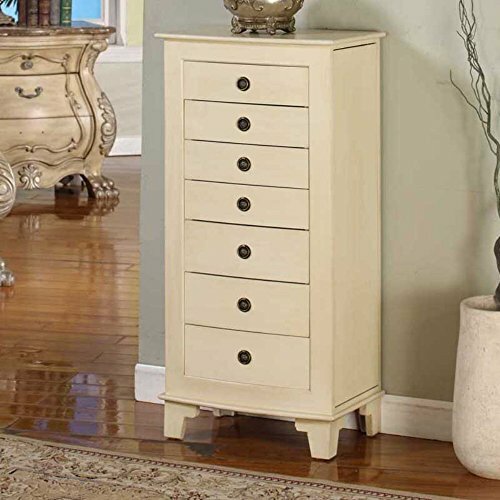 By choosing the Cayman Locking Jewelry Armoire in the cream color you can enjoy the beautiful workmanship put into this majestic piece of furniture as much as your treasured items of jewelry stored in a well-organized way in a single place. Incorporating seven spacious and lined in protective black plush lined drawers, a mirror on top and two side cabinets concealed by doors, this classy piece is the perfect solution for a decor and storage improvement of a home or a retail store. 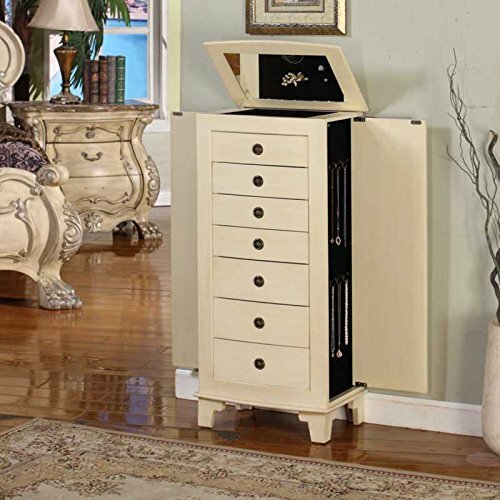 By adding this fantastic Cayman Locking Jewelry Armoire to your home decor you will streamline your accessorizing routine and keep your entire jewelry collection safe and organized in the most elegant way possible. This cream, sophisticated jewelry armoire features a sleek, statuesque design that makes this piece of furniture a gorgeous addition to your bedroom, powder room, or for a retail store. The classical style will complete the room’s vibe, making a great match with your other furniture pieces, anything from natural fibers to neutral colors. Made out of MDF wood construction, it’s sturdiness will prove it is a long lasting investment. 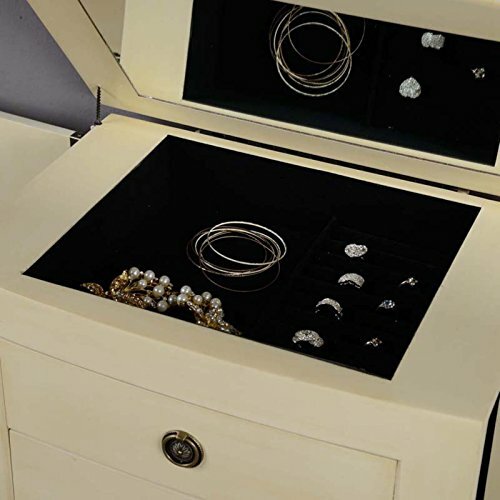 The Cayman Locking Jewelry Armoire also includes an innovative locking system to keep, for example, small children, out of your valuable jewelry storage system. Seven drawers provide plenty of space for all your jewelry collection. For even more storage options, there are two side compartments with hooks allowing you to hang necklaces, scarves, and other accessories. The top of this jewelry armoire features a mirror, ring rolls department and some open space for other accessories. The built-in mirror is perfect for checking your accessories or make-up before you head out for the day. With 19W x 13D x 40H dimensions and weighting around 88 pounds, this elegant armoire will keep your precious jewelry organized in one place and safe due to the protective and plush black felt from the drawers’ interior. In this way you will be able to conveniently find each piece of jewelry you’re looking for, without losing much time or without scratching it, perfectly completing any outfit.